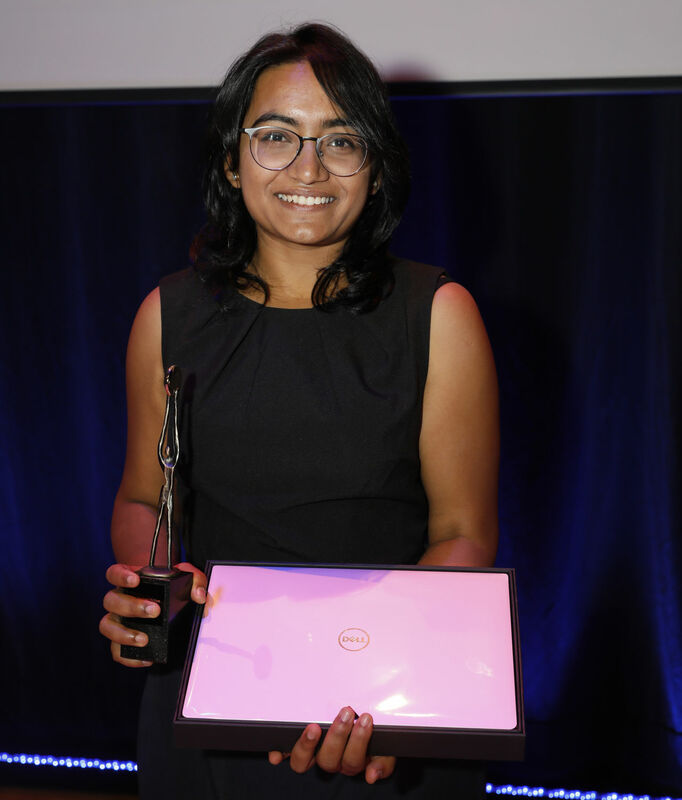 Rhythima Shinde is Best Graduate 2018 at TU Delft. She graduated from the Faculty of Technology, Policy and Management (TPM). 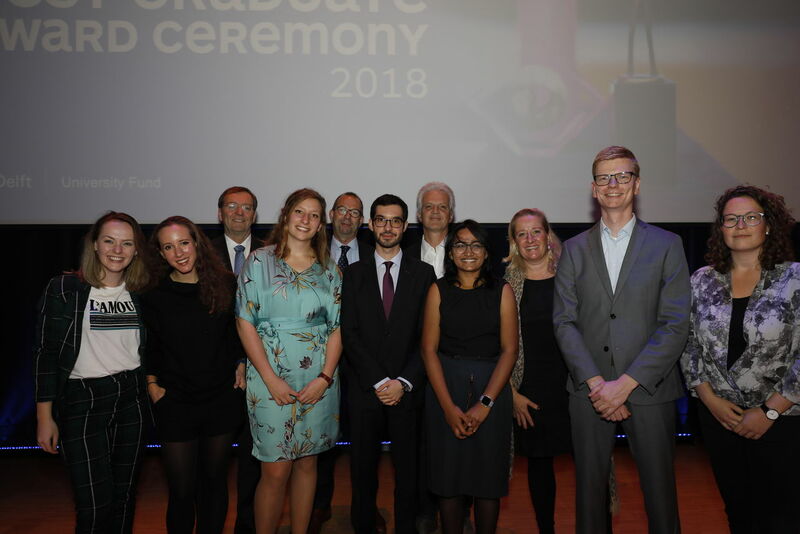 Today, at the TU Delft Best Graduate Award Ceremony 2018, eight Best Graduates, each representing their own faculty, competed for the ultimate title of TU Delft Best Graduate 2018. The graduates, 5 women and 3 men, each pitched their research and results of their master thesis. Approximately 200 teachers, professors, students, friends and family members cheered them on in the Aula Conference Center of TU Delft. After the presentations, the jury, consisting of Rob Mudde (Vice Rector Magnificus/Vice President Education), Peter Wieringa (Vice Rector TU Delft), Cees Dekker (TU Delft Best Professor 2018), Jet Gispen (TU Delft Best Graduate 2017) and Evelyne Esveld (Director Delft University Fund), had the difficult task of selecting the ultimate winner. In the meantime, the audience was entertained by Krashna Musika, the classical music student society in Delft. Rhythima's career in Delft encompasses the successful completion of two MSc programmes: MSc Engineering and Policy Analysis (EPA), with honours, and MSc Computer Science. For her thesis, she researched the electrification of rural India through institutional innovation. She received an impressive 9.5 for her thesis. Read more about Rhythima here. All eight Best Graduates receive the Best Graduate Medal and Certificate of Excellence in recognition of their graduation work, personal dedication, general study results and the way in which they achieved these. In addition, they receive a personal cash prize of 1,000 euro. Rhythima received, in addition to the statuette Towards a bright future, an extra cash prize of 2,500 euro, a KIVI membership and a new laptop offered by Dell. Evelyne Esveld, director of the University Fund: "Delft University Fund is proud to award the TU Delft Best Graduates for their outstanding contributions. These eight engineers have all pushed their limits in the final phase of their study. Their personal efforts, dedication and inventiveness have resulted in eight exceptionally excellent theses. And with this exceptional achievement comes the prestigious title and prize Best Graduate."